When I first got this set, I thought the frames were different colors. Turns out they have a film on the edges of the frame to keep them from scratching. Once removed they were the same color, black. The prints are a nice accent to a cabin themed master bedroom. 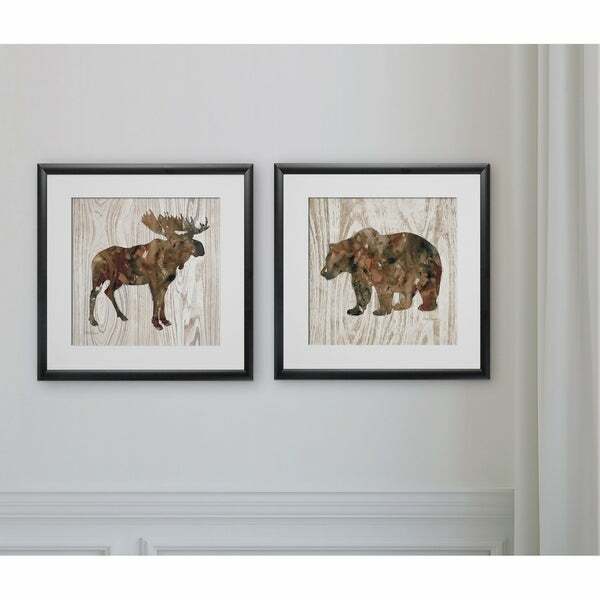 Pine Forest Moose & Bear -2 Piece Set 2 Custom Framed Prints. 100% and created to last. Individually printed and framed by hand to very high standards. Printed and inspected one at a time utilizing the latest archival UltraChrome Giclee inks Consisting of 2 Total Framed Pieces Each measuring 16''x16'' x .75'' deep Each Piece is Individually Framed Acrylic Glass Each piece includes hanging accessories and is ready to hang. You need only to apply an anchor to the wall of your choice.